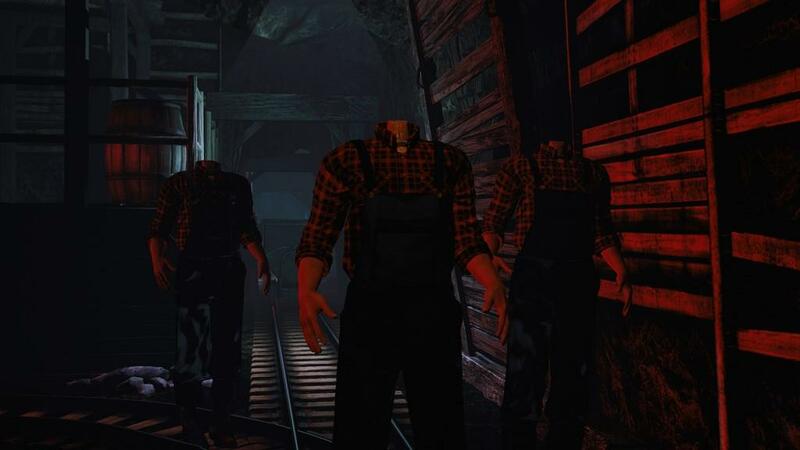 There’s one genre of games for VR that I just can’t take and that’s horror games. I’m no good with jump scares and VR makes those experiences ten times more intense than if you were to just see it on the monitor. So when HTC asked if I wanted to check out Ghost Town Mine Ride & Shootin’ Gallery, I should have said no. 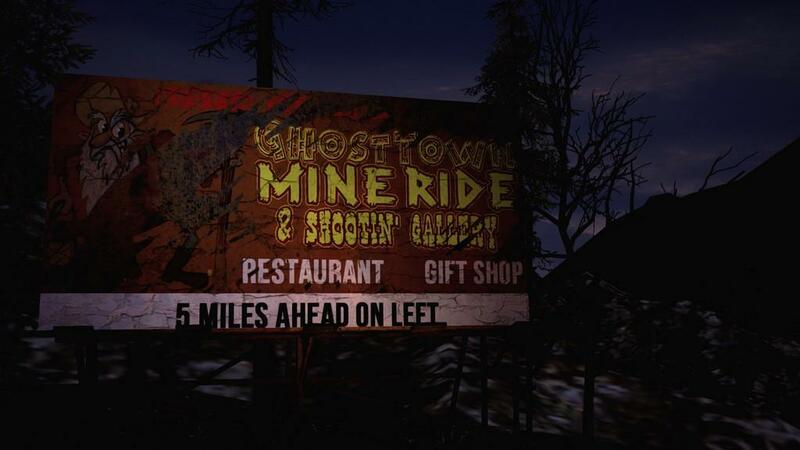 Ghost Town is brought to you by Spectral Illusions, no strangers to VR and horror games. 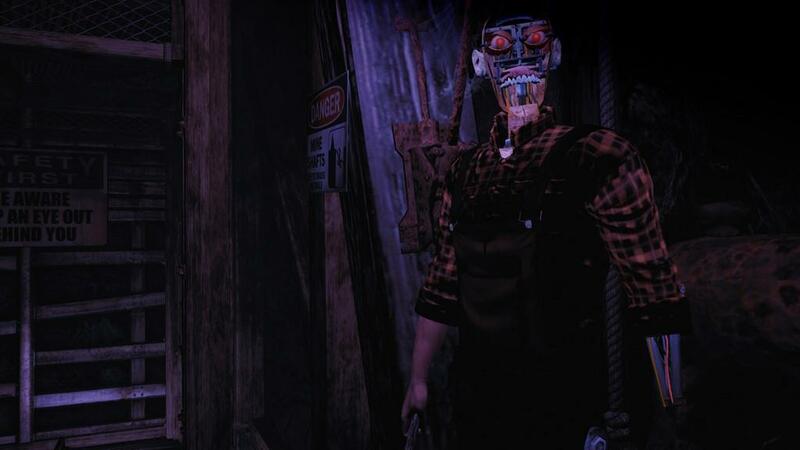 The game takes you through an abandoned and haunted attraction that’s modeled after those popular mine rides that a few amusement parks have. You’re armed with a six shooter, which you reload by pressing on the thumbpad. On your left hand is a flashlight, which you can turn on and off. I don’t know why you would ever want to turn it off, but you can. Holding down the trigger will make you walk in the direction of where you are pointing the flashlight so the game relies on the traditional walking mechanic to traverse through the game when you aren’t in a mine cart. It does move rather slow, but because it’s not using something like a teleport, those who are prone to motion sickness might not have a comfortable experience. You also have a helmet light to light up the environment and you’ll definitely want to use both the flashlight and your helmet light in the game. Most of the environments are very, very dark and Spectral Illusions does a great job at creating an impressive claustrophobic and scary mine ride enhanced by the use of lighting and lack thereof. 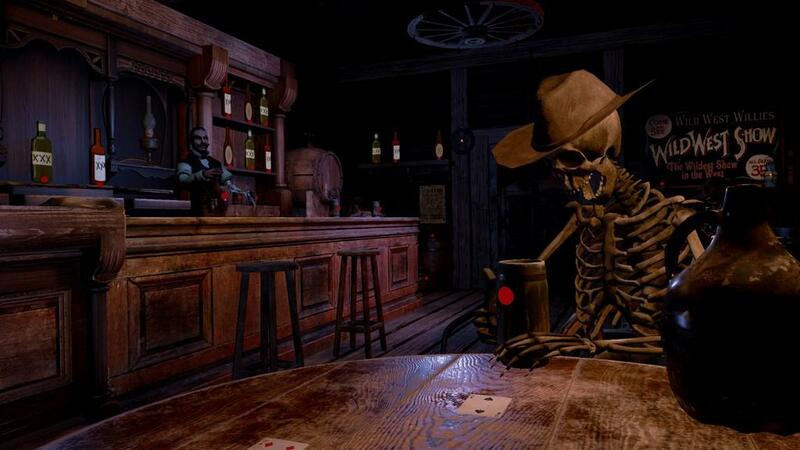 Ghost Town Mine Ride utilizes the Unreal Engine to create a visually impressive experience. As mentioned before, the lighting effects are really effective. The models of the various animatronics are done very well with good movement. A lot of them are in a rundown condition so you see the robotics underneath the skin, giving them a pretty creepy look. Along with the creepy animatronics is the “ghost” that appears in front of you sometimes. 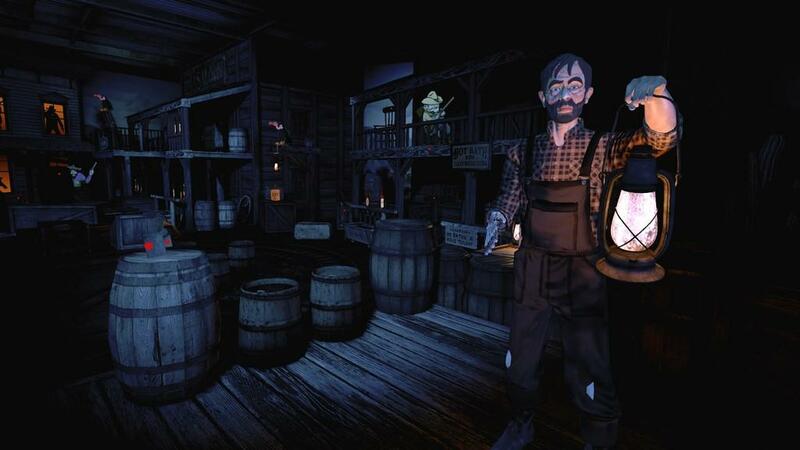 In a miner’s outfit and a gas mask, the apparition will keep you on your toes and make you jump a few times. Yeah, it does a few things to try and kill you and a lot of them are the source of the jump scares in Ghost Town Mine Ride & Shootin’ Gallery. The mine ride itself is pretty impressive. There’s underground waterfalls, waterwheels, dark caves, and various wooden supports that helps prevents cave ins. When not being scared out of my wits, it does look really cool in VR. You really feel like you’re down in some dark, dangerous mine as you scan around and yes, I did feel like I was in a very small space at times. Most of the time is spent shooting, but there a small select places you can interact with the environment, such as opening a door or pushing a plunger. You can pick up some objects as well by using the grip buttons, but for the most part, it’s shooting at anything that moves and walking or riding through the mine. The use of sound is used well to enhance the mood. Half of the time, you’ll hear ambient noises from the mine, maybe a bat, or some rats. But when things come at you, and they will plenty of times, you’ll get that sudden horror music or scream that coincides when something jumps out at you. Jump scares are a plenty and they do come from a few different sources. Rather than give away what you’ll experience, I’ll say the game doesn’t disappoint in this department. There were many times I just had to take a small time out, a deep breath, and build up the courage to continue. Really, if it wasn’t in VR I would’ve been fine. I even tried just putting the Vive on top of my head and watching the monitor as I walked through the mine. The jump scares weren’t nearly as terrifying when I didn’t feel like I was in the middle of it. Putting the Vive back on, yeah. I was reduced to a blubbering idiot more than a few times. When things go wrong, things go really wrong. You have to try to get out of the mine without dying. Luckily, you’ll respawn really close to where you die if you do, so you don’t have to spend a lot of time redoing sequences. It won’t take you more than a few tries to get past any of the parts that you can die in and you’re shown at the end how many times you did die. 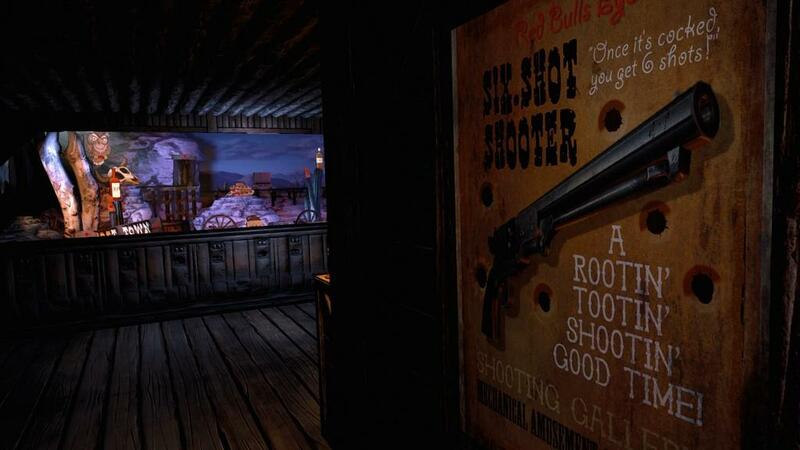 Everything comes together to make Ghost Town Mine Ride & Shootin’ Gallery a pretty intense horror game. It takes around 30 minutes to complete it, provided you don’t die too much. There’s no saving so if you stop, you’ll have to start all over again, which is a little bit annoying. Once you get through it, there’s not much incentive to go back as the experience is the same. The game would be a nice party option just to see how people do with it and witness their reactions when things start going to Hell. If you’re a fan of horror experiences and want to be scared silly, Ghost Town Mine Ride & Shootin’ Gallery is a good pickup. It’ll give you a nice adrenaline rush at times and the game visually looks impressive. Limited in replay value, it’s a good title to have a lot of people try, provided they don’t get sick from the traditional walking controls.